Storage for extra linens, toys or off-season clothing. Padded with densified fiber for comfort and to avoid any sharp edges. Insides are covered in a black mesh cloth. Bottom outside is upholstered in a 7 oz. bright pink fabric. All-over pattern of flowers, leaves and butterflies. 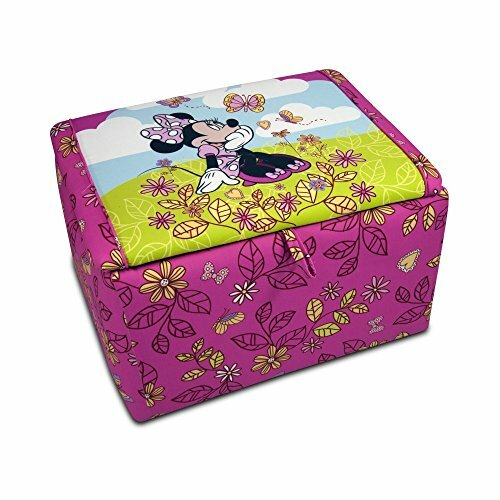 Top surface with image of Minnie mouse sitting on the grass dressed in her pink and white polka-dotted dress. Matching pink tab sewn on the front edge to use to lift the lid up. Lid is attached to the bottom using hinges that are spring-loaded for support. Curved, recessed openings on both sides that serve as "air holes". Plastic knobs on each corner to avoid wear and tear of the fabric. May be cleaned with damp cloth, mild soap and water. Recommended ages: Four years and above. Made from 50% wood, 25% densified fiber, 3% metal, 2% plastic and 20% fabric. Made in USA. No assembly required. 28 in. W x 20 in. D x 16 in. H (37 lbs. ).